In the wake of Hurricane Sandy, any observer of the media noticed the news coverage moving from warnings and advisories to recovery efforts and recuperation. Today, we see the coverage of the President making his way to the hardest hit areas of New York City, as well as the tragic stories from the tens of thousands of people left homeless from the disaster. As specialists working in the big data field, what’s interesting to observe in retrospect is how our industry influences disaster relief and recovery efforts. This is especially interesting if one observes a major player in the disaster relief: Walmart. During disasters, Walmart implements its own nationwide response center. From a cutting edge shipping network to high speed communications, Walmart has even outdone the Federal Emergency Management Agency (FEMA) in response time during disasters. After Hurricane Katrina, Walmart responded with food and supplies quicker than FEMA. The reason for this immediate response goes deeper than a sophisticated shipping network. The Arkansas-based discount retailer has detailed data on what the different markets require in the aftermath of disasters. During Katrina, the emergency operations command center received on the spot data regarding supplies and the needs of the communities. When flooding got worse, for example, staff would order more mops, bleach, and other needed items. It is these logistics skills (due to its necessity to operate within its own competitive business environment), honed in by being in tune with data and market analytics, that really worked for the chain retailer, and goes to show how a large company’s record linkage within all the various small markets and communities helped hone into understanding the disaster recovery needs. FEMA doesn’t have the intricate systems in place to equal the power of Walmart or other large corporations. 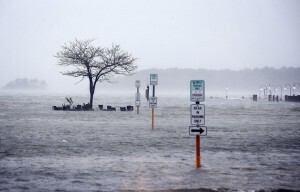 Record linkage and understanding also influenced some of the information disseminated to the public prior to the beginning of Hurricane Sandy. For example, one analytics and information services company released data October 29th, right before the storm, that listed the top 25 zip codes in the greater New York City area that were at risk of exposure to residential property damage (which happened to be Massapequa, NY). Other data included were the total number of residential properties at risk and the value of these properties. While the information on zip codes may be valuable for the public initially as an advisory, it is the additional information provided that would certainly be helpful to those who work in real estate, construction, and the insurance markets after the storm. The strong insight gained from this type of data collection shows some important things: how big data can be both a public service for those in need, and how it can also serve as a business tool for strategists to gain the necessary knowledge to take decisive action in the wake of natural disasters like Katrina or Sandy. And, whether you like it or not, Walmart is clearly better positioned than FEMA to provide timely relief in the wake of disasters. From data scrubbing to fuzzy matching algorithms, Data Ladder’s suite of data cleansing tools are a great fit for companies large and small. Talk with a data specialist today and start your free trial of Data Match 2012.